I guess everyone likes to know where he puts his money and how it is spent. So starting with a budget or expense sheet would be a great starter. This is the result we are going to reach. 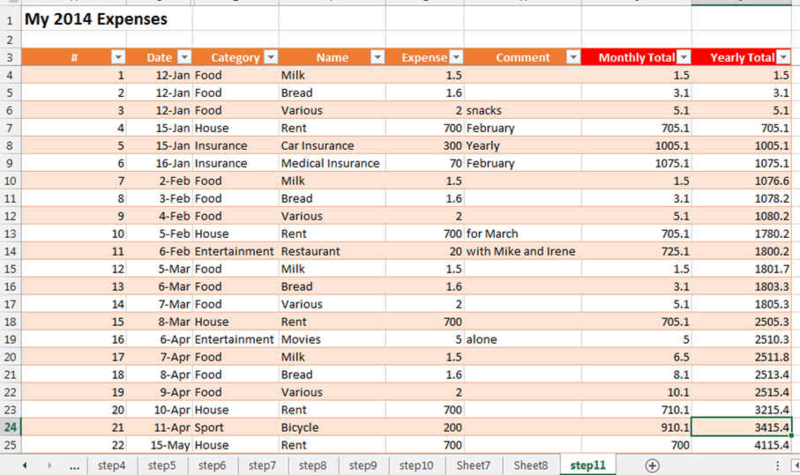 One table where you enter the data and another chart where you can easily see what you spent. 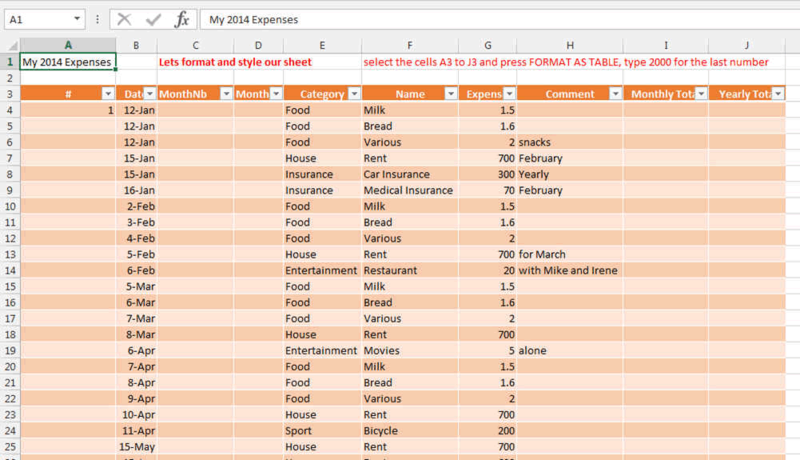 This is the Excel chart that displays your expenses and budget. Of course the colours, the styles are can be changed to your likings. Lets define what we need to track our expenses. We need to enter a date, the item name, the expense and a comment maybe. 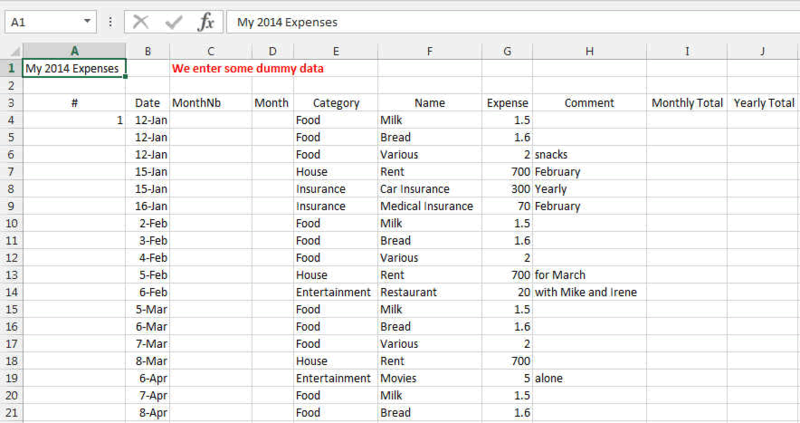 Excel has to calculate by itself, the monthly total, the yearly total and then display it. In the new blank worksheet we are going to enter the headers of our columns. We can also enter some dummy data, or you can enter some real data if you want. Lets create the table now. We are going to plan for a table with 2000 entries. But you can change this. So select all the cells that contain the titles. Then press CTRL-T (or the Insert TABLE button in the INSERT Ribbon). In this window, change the number behind the $ sign to 2000. Select MY TABLE HAS HEADERS and press OK.
Now we have to enter some formulas where the calculation will be done. Type what you see on the screen. 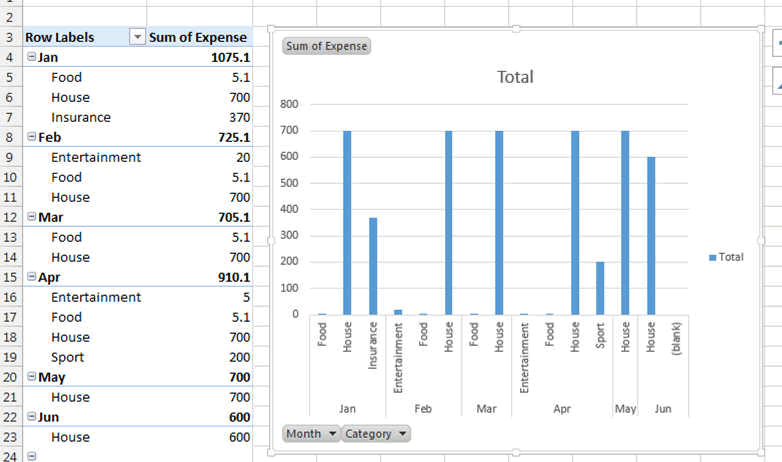 You can see the formulas by clicking in the Ribbon FORMULAS the options "show formulas"
This sums the yearly expenses. Lets go the the next page.